Unlike many other VPN services, ExpressVPN has an assertive statement on their website. They do claim that they are “the fastest VPN on earth”. In this ExpressVPN review we will be going through so many tests -from speed, streaming, uploading, popcorn time, torrenting to the unblocking websites. Then we will come to a verdict on if they are really fast or that statement is just promotional words. ExpressVPN China! Is it working over there? Log policy – Does ExpressVPN keep any logs? Founded in 2009, ExpressVPN is one of the top service providers in the market. In the software, you can find 4 different region section as well as subregions. No matter where you are located, you will be able to find a server close to you. In total, ExpressVPN covers more than 90 countries. In other words, there is no spot in the world where ExpressVPN has not landed dedicated VPN servers. At the moment the number of the server is 2000 and counting more. The coverage and the number of the servers look promising. Yet, how about the speed performance? Great performance for Netflix, iPlayer, torrenting and Popcorn time. Up to 3 simultaneous devices. No logging policy. Compatible with smart devices. No risk 30 days money-back guarantee.Try ExpressVPN now. 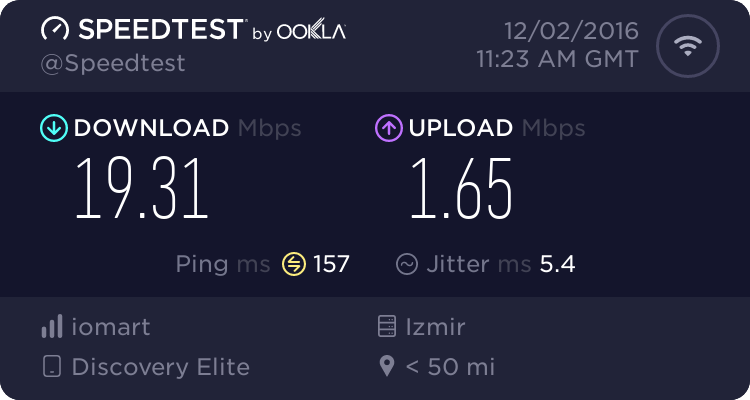 Claimed by the company itself “fastest VPN on earth” actually could not meet my speed expectation during the evening period when servers are super busy. I was super excited while doing the test. However, the speed results kinda killed my excitement. You can see the detailed speed results below. All of the speed tests were handled by 50mbit download 10mbit upload fiber connection in a European country. Unfortunately, I cannot tell you that ExpressVPN is super fast. However, the speed I got from European countries is well enough for browsing, streaming and watching videos in 720p. Note: The speed you will get may vary according to connection speed, the country you are located and the periods when accessing the internet. If the period is at its peak like 9pm-1am, it is very possible that you will have lower test results. Unlike the speed test result, I got from Amsterdam, downloading torrent with ExpressVPN was quite faster. I tried to download a tv show with more than 10k seeds and it took around 20 min. You can see the torrent downloading speed below. At first, collecting seeds took plenty of time. After that ExpressVPN started downloading the file at around 400kb/secs and later on the speed reached up to 1mb/sec. However, there were so many ups and downs during the download that downloading 446 Mb file took more time than expected. The torrenting speed is fine. You just need to bear with the speed performance of overloaded P2P servers. For those who are not familiar with Popcorn time, it is a kind of tv show and movie torrenting service letting you watch the videos while downloading. In order for us to have a smooth watching experience, we must have a reliable and stable server along with good download speed. As we will be downloading copyrighted materials, we have to use choose a country where such action is permitted under law. You can always go for Netherlands, Spain or Romania servers. We have tested ExpressVPN with a Popcorn time with a famous tv show having around 1000 download seeds. Collecting and getting the seeds took around 20 seconds. After that software started to download the tv show. ExpressVPN proved to be efficient and fast enough to watch a 720p show with a smooth experience. Netflix has started a war against using VPN and proxy services. Therefore, the steps will we be taking are a little bit different than just connecting to a server and unblock anything. As Netflix has been blocking the IP address of the VPN services, you may need additional help from the ExpressVPN customer support. At first, I tried to connect to the New York server to watch a random TV show. However, I was caught and I could not watch. Here is the screenshot. I got back to customer support and ask for help. They suggest me to use the Washington DC servers and I did. At first, you might think that ExpressVPN is not working with Netflix. However, there is always a workaround and all you have to do is just contact to customer server, learn the right server. BBC iPlayer is another online streaming platform where you can find amazing BBC programs. If you are outside the United Kingdom, you won’t be able to play any shows/documentaries. Once you log into ExpressVPN and select a server from England, you will be able to watch any shows on this website. First 3 servers failed to unblock iPlayer. However, the last one United Kingdom – Kent server proved to be working fine. Trial and error is the only option at the moment to find out the working server to unblock iPlayer at the moment. FYI – you can also contact customer service to learn the details. The server performance you will get from the UK – Kent server is fast enough to watch any show in HD mode. Moreover, ExpressVPN has plenty of UK server you can switch and unblocked iPlayer just in case one of them does not work. Servers, good speed, and customer support cost money. ExpressVPN is one of the most expensive VPN service providers in the market. Pricing ranges from 12.95$/Month, 59,95$/6 months and 99,95$/15 months. Earlier, ExpressVPN payment gateway was poor. In years, they partnered with many other companies like Bitpay, AliPay, Mint, Yandex Money etc… I am pretty sure that you will be able to find a payment gateway to complete the purchase. If you are not happy with the service you are getting, you may cancel your account within 30 days and get your money back. However, you should be aware of some specific statements in the refund policy. The software is working on your device. Customer support does contact you to fix the problem. You buy more than 5 accounts under volume program. Simply you can only ask if the software is not working and you have to prove it. In a case, the software is not working and you can ask for a refund, it will be issued within 7 days. You may regard this as an ExpressVPN trial period. We do so many things with our mobile devices. It even started to take over the laptop or desktop work burden. In that sense, it has great importance to keep the privacy and security on the go. ExpressVPN is aware of this and it has mobile apps for iOS, Android, and Blackberry devices. Besides security purposes, I tend to use a VPN service to browse social media apps –Instagram, Facebook, and Twitter- as they are sometimes being throttled by the government in Turkey, Russia, Ukraine or China. Speaking o mobile apps; a clean design welcomes you when you first open the application. You can simply choose a server by clicking the “Choose Location” button. Another option you may want to use is to choose the desired protocol for enhanced security purposes. I was super surprised when I ran a mobile speed test. The result is a lot better than the desktop test and good enough to handle streaming, downloading, and browsing purposes. Below you can see the result I got. Overall mobile experience with ExpressVPN is truly amazing. Note: In order to download and activate the software for desktop, you have to buy the service first then input your ExpressVPN activation code. You can use the desktop version on your other mobile devices. Moreover, do not search and fall for ExpressVPN crack version, as there is no such a thing. If you come across a crack download link, it is a scam. Similar to the mobile apps, ExpressVPN has a clean and redesigned desktop software as well. Contrary to the previous versions, the new software got rid of plenty of unnecessary features and became newbie friendly. You can select your preferred server. You can add shortcuts to the second tab. Connect or disconnect from VPN. When you click on the server list, the software will prompt a listing under the “Recommended” category. You can either choose the servers there or click on “All” to list all countries. Furthermore, if you do not like to scan all list, you can always search the desired one and connect to it with a double click! If you are familiar with the previous version of the ExpressVPN, you might be surprised by the latest one! Almost all of the unnecessary features are omitted for better user experience. Great job! There are two important features under the “General” settings. Network lock acts as if “kill switch” and it will stop all traffic in case your device disconnect from the VPN server. “Split Tunneling” is a new ExpressVPN feature that you can decide which app will use the VPN connection and which one does not! In the “Protocol” tab, ExpressVPN used to have plenty of options. Yet, now you can either go for OpenVPN or L2TP. As for the SSTP or PPTP are only available for the Windows users! We will discuss these protocols in the “Security protocols” category. DNS feature to force your device to use ExpressVPN secure DNS so that there is no leak! Overall, I really like the new and clean version of the ExpressVPN software. It is highly recommended for any VPN users! Plus, we will add one more points to ExpressVPN “Software” rating because of the latest improvements and bug fixes! Technology is moving so fast that we are being surrounded by a new smart device each day. This also leads us to use VPN in such new devices. Other than PC and smartphones, you may also use ExpressVPN with routers, as well as browsers as well. Speaking of browsers, you have to be careful with ExpressVPN. Actually, it is not a good option for you. You have to connect to VPN software and connect to a server to use the browser extension. In that manner, you cannot use the service with Chromebooks. Moreover, make sure to check ExpressVPN supported router page to see if they are compatible or not. StrongVPN offers plenty of protocol options you can pick. Pre-set option for all users is “Choose protocol automatically”. However, you have the option to choose OpenVPN UDP – TCP, L2TP, PPTP, and SSTP protocols. Each protocol has a different speed and security combination. Therefore, it would be logical to go for a least secure protocol (PPTP) while watching shows or unblocking any websites. If you truly believe that you need higher privacy -for example; while using your credit card online… etc- you might want to choose OpenVPN or SSTP. Note 2: The number of available servers may vary depending on the protocol you choose in the software. ExpressVPN does not provide any free service. All apps and software are pay to download. Yesterday I contacted my friend in China and asked him to search ExpressVPN in Google. However, he needed a VPN service to do some research on Google. That is a big irony, indeed. Moreover, I did some research on Baidu.com -Biggest Chinese search engine- I came across some of the sub-ExpressVPN websites like express-vpn.com, expressvpn.cc. Therefore, if you are having any problem with the main ExpressVPN website, you can always do your research on the local search engines and purchase the software from tier websites. The biggest problem with the ExpressVPN is that when you want to use the VPN service on your smartphone, you have to download the APK file first, then try to connect VPN servers as you cannot connect to Google Play. Another option is to get your phone and other mobile devices ready before you move into China. ExpressVPN is a USA based company. Thinking of 8 hours difference and sending a chat request early in the morning in Turkey GMT +2 12:02, would make it late night 4 AM. Yet, I was able to contact the customer support representant less than a minute. I asked a few questions and the reply was informative and fast. Express VPN has a clear statement saying that “We are committed to your privacy and do not collect or log traffic data or browsing activity from individual users connected to our VPN.” However, some of the details you give them while registration may be stored in the third parties to contact you and collect user experience information. The server you connect via VPN software is also stored as well as the amount of data you are using while connected to VPN. This might be a little bit concerning for the user end. The company states they need this information to give the best network experience to users. On the other hand, it might come as a caution to prevent continuous server abuse by downloading or torrenting all day long. Downloading, uploading and reproducing copyrighted materials. Using services anything than lawful purposes. Note 3: ExpressVPN proved that they are %100 activity log free. Please refer to this article and learn more details about the incident. As you have already seen at the top, ExpressVPN proved to be working for any VPN required platforms. Having anonymous and secure browsing on the internet is another big deal you will be getting from ExpressVPN along with its high encryption protocols. Yet, according to my test results, it is hard to name ExpressVPN “The fastest VPN on earth”. Yes, they are fast. However, we will need more reviews to prove this statement. One of the UK servers connected me to a middle east country. Definitely, software needs an update.